Sony's new-wave handheld PSP game device breaks on Japanese shores 12 December. Unfortunately, anyone beyond the Land of the Rising Sun will have to wait until March (maybe) to get their hands on one. Those with a wad of yen (dollars or Euros) to spend, though, can plunk it down right now on another Sony entertainment gizmo — one that sits on your lap instead of in your palm. 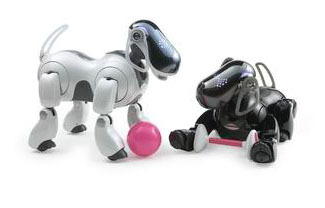 Enhanced wireless connections have Sony's newest version of their PC pooch Aibo sitting up and playing music, taking photos and dancing to a wireless beat. KDDI and Fujistu have introduced a prototype smart phone, or "hybrid information terminal," that will be available to visitors attending the Aichi World Expo 2005, which begins here in March and runs through to the end of September. The 'Love and Mate' [.jpg] (yes, that's what they're calling it) handset comes in Orange and Blue; both feature Windows Mobile 2003 Second Edition for PocketPC software for PDA and phone operation, and Windows Media Player 9. This is one of the first deployments of Windows on a phone in Japan. NEC Corporation today announced that it has received an order for its Messaging Intelligent Router MMS (MIR) solution from Telefonica Moviles Espana, S.A., Spain's largest mobile operator with 18.7 million subscribers. With a population of 41.11 million people and an 83% mobile phone penetration rate, Spain boasts one of the highest levels of mobile phone penetration in Europe. The MIR Solution is a server software system that can easily be added on to existing MMS (Multimedia Messaging Service) and mail server systems of mobile operators. The MIR solution is an advanced, new method to extract necessary data from MMSs and transfer it to a charging system enabling flexible and attractive charging menus. Open registration for dotMP has commenced and a wide spectrum of business and personal users from Europe, America and Asia have registered their .mp domain names and published mobile content on their dotMP sites. "dotMP is all about the creation of unique online identities and publishing Web and mobile content. We expected a diverse group of users but not this much diversity this quickly," said Gib Bintliff, Saipan DataCom's President. DaTang Mobile successfully demonstrated the first TD-SCDMA Video Phone in Beijing this past week. The video phone, using the Dilithium Networks market leading 3G video telephony protocol stack, achieved high quality end-to-end video telephony with 15 frames/second video communications on 64 kb/s bearer. In addition to the basic video telephony function, DaTang Mobile also demonstrated the "Picture in Picture", "Picture Shelter" and "Voice Shelter" enhanced functions. The demonstration also featured Dilithium Networks patent pending AnswerFast technology, which significantly reduces the session set-up time. Vodafone K.K. have just announced they will commence sales of their new 3G handset lineup, the Vodafone 902/802/702-series, starting with Nokia'a V702NK [.jpg image] 8 December in the Kanto-Koshin region, 10 December in the Tokai and Kansai regions, and other areas following thereafter. New Vodafone live! 3G services like video call roaming, large-size mail, and streaming will also be offered from 8 December to coincide with the sales launch. In yesterday's WWJ Newsletter, I mentioned the news last month that DoCoMo had developed a software platform for FOMA 3G phones — comprising two options: both Linux and Symbian (sorry Bill! ), adding "This is big news." WWJ's ever-keen Digital Media Director Lawrence Cosh-Ishii pointed out last night that, in December 2003, we carried a video report from Big D's year-end presser wherein then-CEO Tachikawa said: "Simply speaking, Microsoft is not offering an open standard and an open minded approach" and that DoCoMo "prefers Symbian and possibly Linux for 3G OS." Never let it be said that WWJ editors miss a chance to say We Told You So! Virgin Group chief Richard Branson said he has earmarked $300 million for a cellular phone joint venture in China, the world's largest mobile market by users. Branson, whose mobile operations resell other carriers' service under the Virgin brand, aims to have a 50-50 venture with a Chinese partner in operation in 12 to 18 months. "The Chinese market is obviously the fastest-growing market in the world. Virgin will be foolish if it is not a player in the market," Branson told reporters. China Mobile Ltd., the world's biggest carrier by subscribers, said on Tuesday it could spend up to 110 billion yuan ($13.29 billion) to build a nationwide 3G mobile network. The company is expected to start building its network shortly after receiving a 3G licence from the government. Market watchers expect that to happen around the middle of next year. In August, the company said the cost of a 3G network could be about 60 billion yuan in the first two to three years, calling the figure a "preliminary rough estimate". Japan's NEC Corporation has selected Ericsson Mobile Platforms for use in the launch of its next generation global WCDMA/GPRS handsets. The first products to be made available within the first half of FY2005 (April 2005 - September 2005), will be based on the Ericsson U100 platform. NEC feels that with the addition of Ericsson Mobile Platforms to its portfolio, NEC will be ready to offer a wider range of 3G mobile terminals to meet the various demands of 3G mobile operators and end users.